It’s Friday! And that means another Must-Play is here! I’ve been trying to clear my ever-growing backlog of games. There’s the last Tomb Raider, Prey and the beautiful Deus Ex: Mankind Divided. There are plenty more games I have to clear, mind you, but I ended up on Mankind Divided, and oh how I forgot how this excels at showing some of the gorgeous art that video games have to show. The highlight of the game is most certainly how it tries to portray civil strife among minorities, and yes there are countless articles out there that dive into the politics of that. That’s not why I’m writing this. The character I’m writing about is the environment. Deus Ex: Mankind Divided manages to take old-school cobblestone-ridden Prague and make a hybrid combination with near-futuristic tech. Kinda coincidental how the game is about combining humans with futuristic tech, yes? In one scene, you are in a police station and everything around you is made of high-tech screens, glass, metal and poly-something surfaces. All very sci-fi, for sure. Then, you open a door to go to the jail cells, and you must go through a winding tunnel of a basement. The transition is so smooth and so beautiful from high-tech sci-fi environment to stone walls from old-times that it makes me stop and just look at the environment. I seriously have just stopped to stare at this game sometimes. Even emerging from a sewer grate, climbing up the ladder to be greeted with windy cobblestone streets with trees, leaves blowing. This is contrasted against hi-tech buildings in the distance. In addition, in some of the ‘downtown’ locations there are benches, there are narrow alleys and roads, but there are also massive translucent screens dotted around the landscape for advertisements. ‘Hole-in-the-wall’ establishments are across the street from big luxury sci-fi banks. 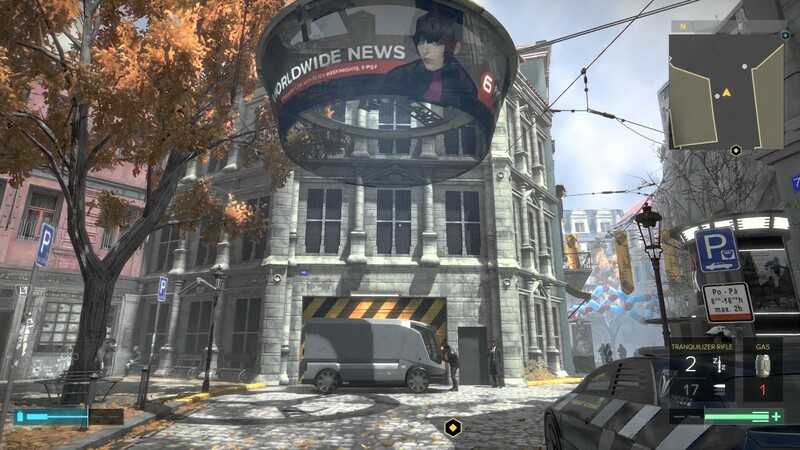 Everything about Deus Ex: Mankind Divided is about contrast, and for how the environment artists pulled this off is absolutely astounding. I highly recommend picking this bad boy up, as its price has been significantly reduced since its release. What about you geeks? Have you tried this one out? Have you ever just stared at a video game for how gorgeous it looked? Tell us in the comments!